There is an infamous quote by the Duke of Wellington regarding his British troops: “our [army] is composed of the scum of the earth — the mere scum of the earth. It is only wonderful that we should be able to make so much out of them afterwards.” (1813) That’s real encouraging, right? How much of his opinion was truth? Today, we’ll take a less-prejudiced approach and discuss Waterloo‘s British Army. Wellington may have been partially right, but he was also partially wrong. The first thing you need to know about the British Army of the Napoleonic Era is that it was made of volunteers. At this time, Britain did not use conscription or draft. Each regiment had to keep enlistments up and this was typically accomplished by sending out a recruiting detail who would make gloriously patriotic appeals (or monetary incentive) to get men to join the ranks. (This is vastly different from the British navy’s impressment policies, but that is another topic for another day). So who actually enlisted? Men looking for work or escape often joined the ranks. This is what prompted Wellington’s disgusted statement. But not every soldier was fleeing a sordid past. Some needed an honest job or had patriotic motives. Then there were the officers. Rank and commissions could be purchased. (See From Lazy Teenager to Waterloo Hero and Jane Austen’s Military for additional details.) Men from middle class families or nobility could purchase an officer’s commission and get a command position will little military experience. However, we must acknowledge with great joy and thanksgiving that there were very good officers in the British Army, and in 1809 actually less than 200 officers where from the nobility class. Though commissions could be purchased, many of “forgotten officers” came from the middle class and did not have the social prejudices of the nobility. Many accepted their role and were good leaders, gaining the respect of their men by fighting alongside them. Strong commanders were admired and loved by their troops, and there are multiple incidents from Waterloo battlefield of soldiers’ being angered and vowing total revenge on their enemies because of a beloved officer’s death. On the whole, British troops were among the better disciplined soldiers of this era, both on the battlefield and march and in civilian towns. In battle, they gained a reputation for fierce fighting, and Napoleon’s generals predicted (correctly) that the British could not be moved from their position at Waterloo. Clothing was not “uniform” in this era of warfare. Each regiment usually adopted something unique. 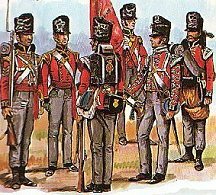 However, a “standard” British uniform was a red coat, white or black or grey pants, and some form of elaborate headwear. Scottish units might chose kilts and red jackets. Stand. Kneel. Lie Down. Stand. Don’t Retreat. Infantry tactics from the Napoleonic Era are fascinating and somewhat complex, so for the sake of time we’ll just talk about what the British infantry did on the main battle line at Waterloo. They started off in a line, a typical British formation in a infantry vs. infantry fight. The line is exactly what it sounds like – soldiers lined up in ranks two or four deep – and this formation produced very effective fire power against attacking French columns. When the cavalry attacks began, the infantry formed squares (squares, triangles, or circles) which placed the soldier facing outward in ranks four deep. The first two ranks knelt with bayonets facing out, the second two ranks shot at the attacking horsemen. None of the British squares at Waterloo broke! A square was very vulnerable to artillery shots, so during some of the heavier artillery fire the officers ordered the men to lie down. And finally, the charge. 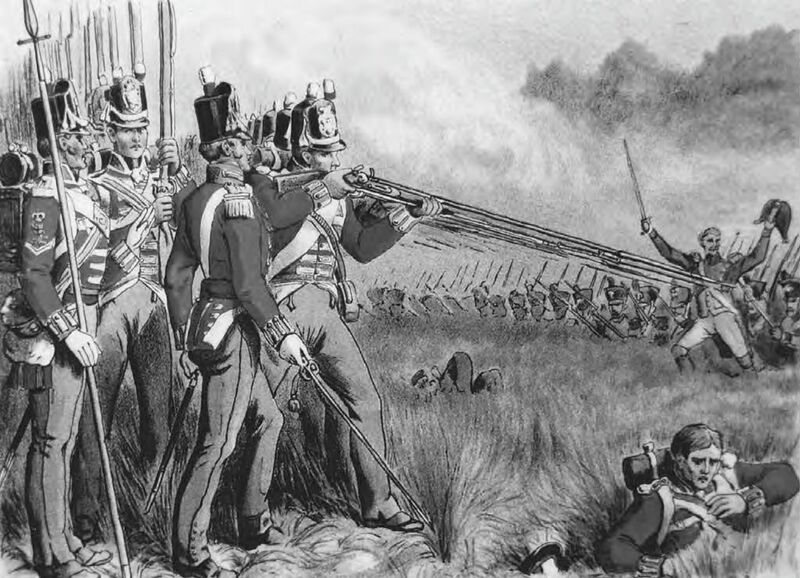 Toward the end of Waterloo, British regiments bayonet charged the faltering French. 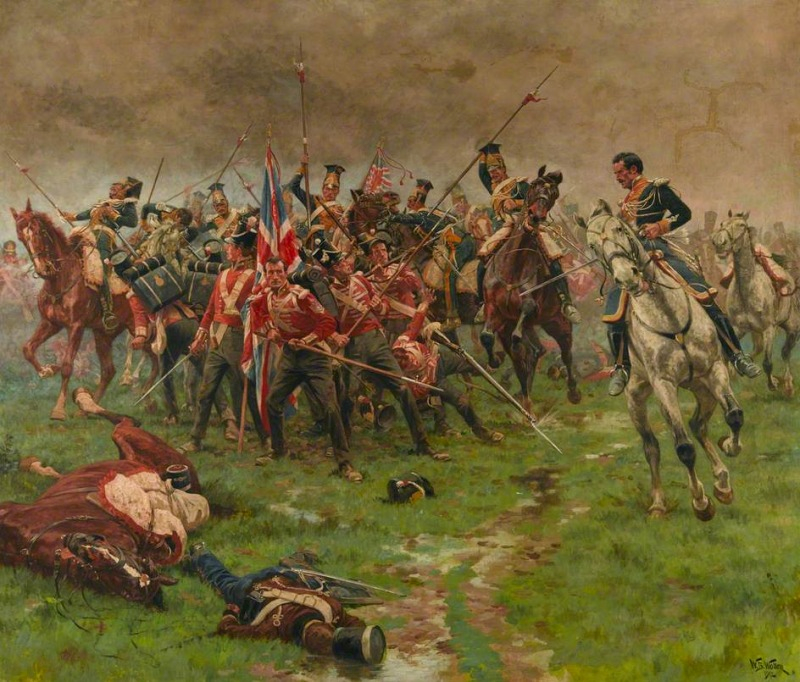 A number of British regiments at Waterloo were not “battle tested” and had never been under fire before. (The majority of the experienced units were still returning from the War of 1812 – ended in 1815 – in America). Thus, the infantry at Waterloo had much to prove and much to win. They proved their capability and courage as soldiers. They proved their ability to lead. They proved their tenacity to stand and never retreat. They won the battle, the won a new Europe, and they won a lasting reputation. At Waterloo, the British army – despite its flaws and the nobility clique surrounding Wellington – won an impressive victory. Immortalized in history, literature, and art, these soldiers may have come from humble or disputed beginnings but ended their story becoming heroes whose actions and courage are still studied today. P.S. Do battlefield actions “redeem” a reputation? Do you agree with Wellington’s quote or was he being a little too harsh and perhaps parading his own ability?